Hove Library is a much loved historic building, but is expensive to run. The age and design of the building means it needs more investment to maintain it for the future. In order to keep providing modern library services to our communities, we are working on generating more income to help cover the costs of operating Hove Library. Council funding from central government is reducing each year and the council needs to drastically reduce costs. All council services, including libraries, are having to change how they deliver services to save money. To keep providing a modern library service that the public use and love, we need to find new ways of generating income. We’ve been looking at a number of options over the past few years to secure the future of Hove Library, including the proposal to move the service into the Hove Museum building. We’ve listened to residents and are working to keep Hove Library in the current building. In early 2017, we held a public exhibition to gauge support for a number of potential new public and commercial spaces in Hove Library. The idea of a cafe, where library users would be able to browse, read, and relax in comfort, was supported by 67% of the people who commented. 77% also supported the idea of developing the basement area, which is currently only used by staff, into a new commercial space such as an office, nursery or café. The first stage in developing these new areas was setting up a new study space for British and Irish Modern Music Institute (BIMM) in the building in spring 2017. We are now looking at converting former offices on the lower ground floor into a nursery and talks are at an advanced stage about setting up a community café integrated into the main library area. The plans for the new and revitalised spaces in Hove Library are shown below, or you can download the Hove Library exhibition plans (PDF 1.51MB) to see them in greater detail. These plans are also currently on display in Hove Library. The library services on offer in the building will not be affected by the changes and the extra income generated will help to safeguard the future of the building as a public library. We believe these plans herald a new bright start for Hove Library. As well as bringing in vital income to help make the library more sustainable, we’ll be working with new partners to make the most of the building’s educational and cultural facilities to reach new audiences and attract library users. We will also be taking the opportunity to carry out refurbishment work, including replacing the flooring on the ground floor, fitting new and replacement shelving, and providing new IT to update the facilities on offer. The main work to the ground and first floor will begin in May, with completion due in late July. We will keep the library open for most of this time, with some parts of the building screened off as required. We will need to close Hove Library completely for two short periods. The first closure will be the week beginning 4 June, and the second will be a week in mid to late July. We will give more details of these when the dates are confirmed. We’ll be creating a new staff workroom on the ground floor, and replacing the shelving from this area along the west wall of the ground floor. There will be no loss of shelving space as a result of these changes. We’re also moving the public PCs to the north wall below the windows. The new staff workroom is needed as we’re moving the existing facilities from the basement to make room for the nursery. The location of the new staff room was agreed by all councillors on the cross-party Hove Library working group, after consideration was given to other locations, such as the lower gallery and the IT room. The alternatives were deemed unfeasible as they were either not fully accessible or too small. Another idea to create a new mezzanine under the skylight was rejected due to cost and loss of daylight to the ground floor. The agreed location is fully supported by the Conservation Officer as a practical solution, as it is in a single height area and will maintain the symmetry of that area by reflecting the shape of the space on the opposite side. We're also restoring special features of the radial area at the back of the ground floor, such as uncovering ornate cornicing and potentially the parquet flooring. As well as the new shelving in the adult and children sections, we’ll be providing new furniture to improve facilities for all library users. On the first floor, we’re enclosing the existing staff office with a new door and timber panelling, purpose-made to match the existing style. There is a proposal for Hove Village Day Nursery to open a new facility on the lower ground floor of Hove Library and the outside garden space at the rear of the building (see the plan above). The alteration work involves installing removable level decking with new steps and hand rails to form an outside play and learning area, a new bike and buggy store and, internally, new toilets suitable for nursery use and other minor alterations. This is subject to a current planning application (BH2018/01123). The nursery already operates the largest day nursery in the city in New Church Road and has a high demand for places. Their existing nursery is rated ‘Outstanding’ in all areas by the education regulator Ofsted. 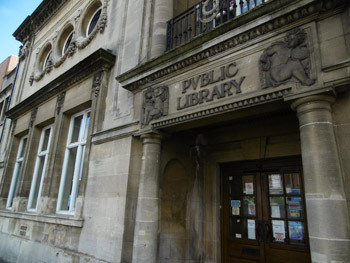 The new setting at Hove Library will cater for pre-school aged children, with a focus on introducing literature through the unique environment within a library. Hove Village is committed to providing funded childcare places in the nursey, including the government’s 30 hours funded childcare scheme. It is aiming to open in September 2018. We are in advanced discussions with a potential community café operator to open in Hove Library. The proposal is for the café to operate from a small servery on the ground floor (area shown in red on the plan).